The influence of English on Various Indian literatures during the nineteenth-century has been circumstantially described by literary scholars and social scientist, who generally agree that the nature of this culture contact was amazingly creative. However scant attention is paid to the entire scale of influence mechanism and to the fundamental linguistic aspects of culture contact. This study by Professor Bhalchadra Nemade, well-known creative writer and scholar in Marathi, is perhaps the first systematic attempt at analysing the name type of the linguistic influence of English on a major India literature as part of Indian acculturation of the nineteenth century. The study has developed a comparative literary concept of influence invoking the entire scale of specific socio-linguistic processes active at the deeper level of society. A work of real originality, it is a remarkable analysis of how a native linguistic system adjusts itself to the new conditions under the pressure of a dominant culture, selects and gradually transforms the alien values into its subsystems during the prolonged colonial period of culture contact, still retaining the age-old aesthetic systems on the strength of the nativist principle. The model of the analysis of linguistic influence constructed in this study may prove to be a fundamental framework for the study of literary influences as well Invaluable for students of comparative literature and linguistics, it is a book of vital importance to anyone interested in nineteenth-century India. I have had the opportunity of developing my own views on influence study into this project while teaching Marathi in England and English in Mahar-ashtra in the non-interfering and healthy academic life at the School of Oriental and African Studies, University of London during 1971-72 and then at the Marathwada University, Aurngabad during 1975-80. I recall with gratitude the quiet generosity of the institutions. In the course of this long preoccupation with two languages I have contracted intellectual debts that I shall never be able to fully acknowledge. As a writer I am given to liking the idea of the whole language – semiotic and aesthetic, past and present, standard and non-standard with the entire range of its verieties. So that in many places the linguist has had to make room for the critic. 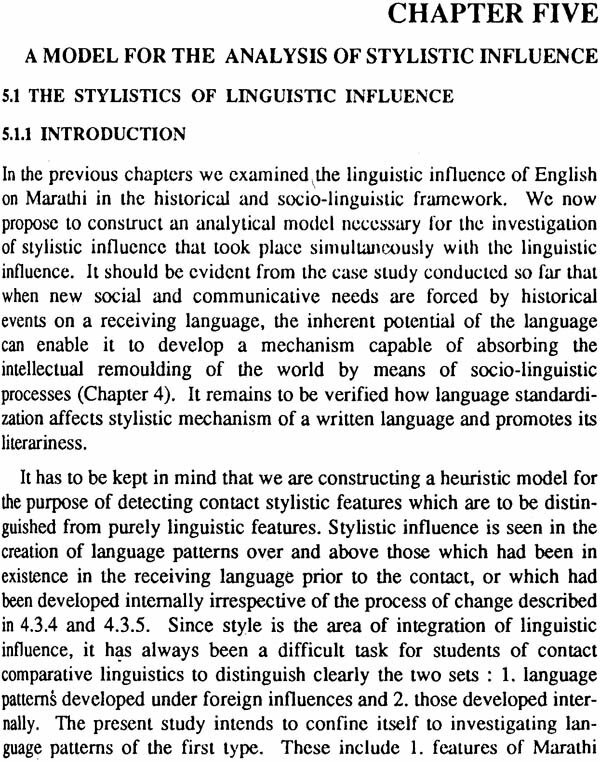 I have also experienced that the model of linguistic influence is equally effective in the study of literary influence by drawing an analogy between the behaviour of a linguistic subsystem and that of a literary subsystem under influence. I would like to record my sense of gratitude to my scholar friends with whom I discussed a number of practical problems and with whose help I could solve them I like to express here my indebtedness especially to Ashok R. Kelkar, R. B. Patankar, G. S. Amur, Lan Raeside, Chandrakant Patil, R. M. Pai, Y. M. Pathan, S. G. Makshe, Ravindra Kimbahune, Afzal Khan, Manavedra Kachole and Pradeep Deshpande. I wish to express my appreciation of the staffs of the following libraries for their assistance: the India Office Library, the Library of the School of Oriental and African Studies, the London University Library and the British Muscum, London; the Marathawada University Library, Pune; and the Mumbai Grantha Sangrahalay, Bombay. I thank the authorities of the Goa University for providing U.G.C. assistance for the publication of this book. And I thank Shri Prabhakar Bhide of Rajhauns Vitaran, Panaji, who taken a very enthusiastic interest in publishing this book. A Note: I have not used diacritical make in the transliteration of Marathi and Indian words (which are naturally many) in order to facilitate easy reading. 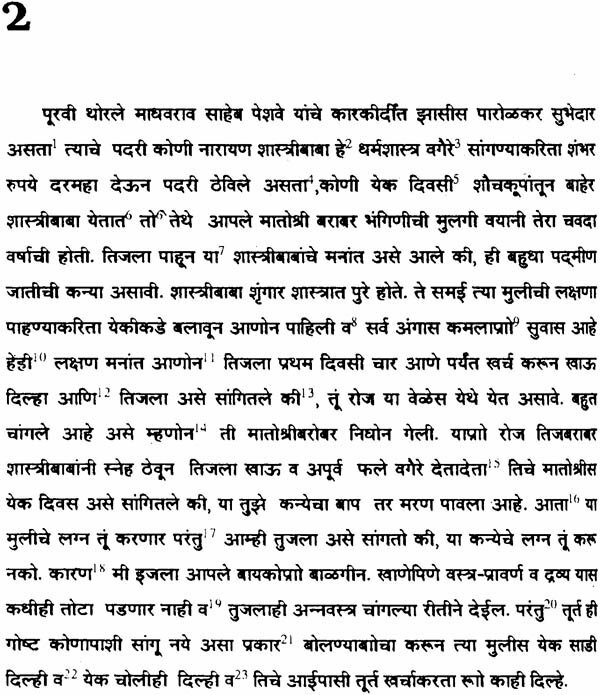 All translation of quotations from the original Marathi cited in this work is mine. The present work is a linguistic study of the influence of the English language on Marathi prose style during its different phases in the nineteenth century. 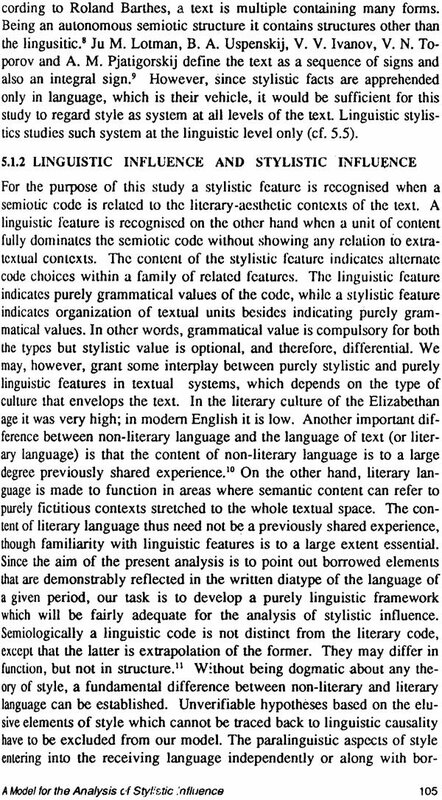 In this study the term style implies a broad spectrum of period style covering within it several substyles of prose genres, individual authors and individual works. It is mainly confined to written literary prose as against non-literary prose, though in the formative phase of any national style this distinction is often blurred. National prose connotes the prose characteristic of the whole language community. Specific term denoting specific styles are used when diverse varieties of prose style such as individual or genre style, written or oral style are form of literature. 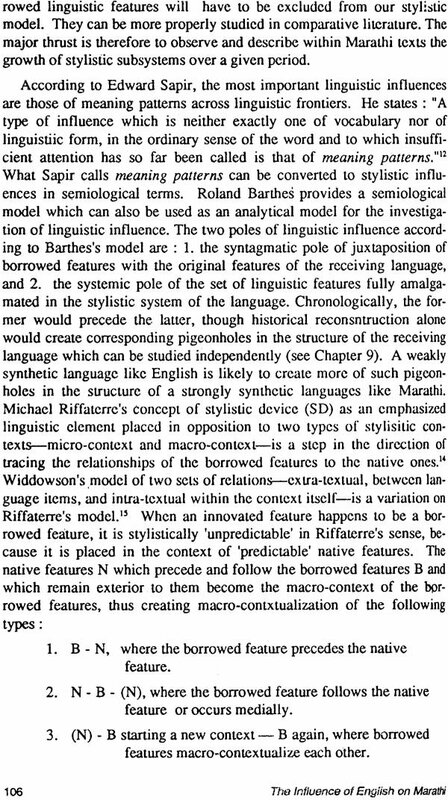 The terms contact and confrontation are indicative of a wide range of political, socio-cultural and literary-aesthetic overtones, though in the present study the terms are used primarily for linguistic phenomena, suggesting two successive stages of the initial impact of a foreign language before the actual process of linguistic borrowing begins. The term influence implies linguistic borrowing systematized in the receiving language. 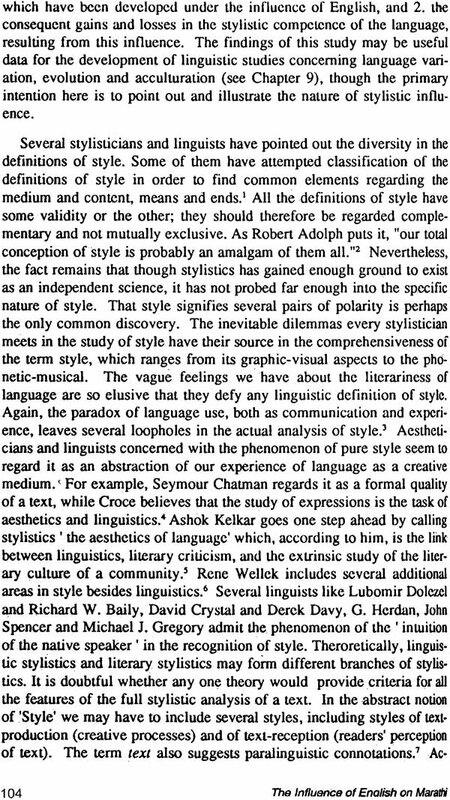 Non-linguistic description of style is avoided for the sake of clarity in argument. The term language id used in both literary and non-literary forms and the various binary concepts of language such as langue and parole; individual and social variavles are taken as influencing factors whenever the influence of the English language as a whole is under discussion. The focus of the study is on stylistic influences of English, although the broad cultural setting in which the language contact took place has been taken into account as an integrating factor in the formation of period style. The contact marked a break in the oral and manuscript cultures of the Indian society by initiating the formation of modern print culture of a literate society which by initiating the formation of modern print culture of a literate society which stores up its social memory Since the formation of Marathi prose style during the nineteenth century is the natural of such a contact, reference is made to the formative processes alone, and other factor which would have contributed to the evolution of Marathi prose style are either hypothesized or indicated in the Notes. Also, since several linguistic and non-linguistic phenomena are at word in the formation of a national style, only those that directly o stylistic are attended to The broad principle that seemingly arbitrary influence of one culture on the other follows definite laws on the level of language is the basic hypothesis of the study. 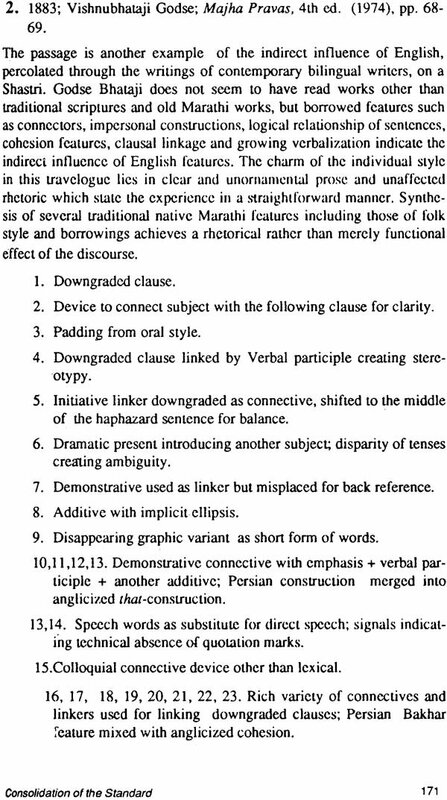 Marathi, after its formation as a New Indo-Aryan language between the fifth and the eighth centuries, developed a considerably rich, though broken, tradition of prose writing from the eleventh century. Scholars have pointed out that the distinct characteristics of Marathi are attributable to the peculiar geographical environment of the Marathi-speaking people. The influence of the English language on Marathi has been circumstantially accepted scholars in various fields. This influence is invariably linked with a renaissance in arts and life by Indian critics and social scientists Foreigners visiting different parts of India during the last century and a half have recognised it as a dominant feature of Indian social life. This is a unique phenomenon in terms of its magnitude and size and is thus capable of multiple interpretations. From the historical-political-sociological to the literary-aes-thetic. As a classic example of cultural contact it gave rise simultaneously and at different phases to various nativistic movements, opposed to one another in nature and kind, such as neo-Hinduism and anti-Brahmanism, Brahmanization and Westernization, glorification of the West and revulsion against the West, anglomania and Anglophobia, revivalism and modernization (see 3.2.3 and 4.2.4.). The studies of concrete problems ansmg out of this contact present a rich field for future research. The areas of confrontation are indeed numerous (see 4.2.1), though the present study confines itself to the confrontation of two linguistic systems. The downfall of the Peshwa rule in 1818 marked the emergence of the British as the sole political power in India. It also made the British the cultural guardians of the backward and stratified Hindu society.' The sense of wonder nurtured by visitors from Marco Polo to Vasco da Gama, with this colonial undertaking dissolved itself into a realistic encounter between two distinct cultural traditions in human history. The culmination of this encounter became more material and real after the 1857 mutiny when the concept of Pax Britannica assumed precedence over all other relationships. This concept assumed the form of 'the white man's burden' in the twentieth century. 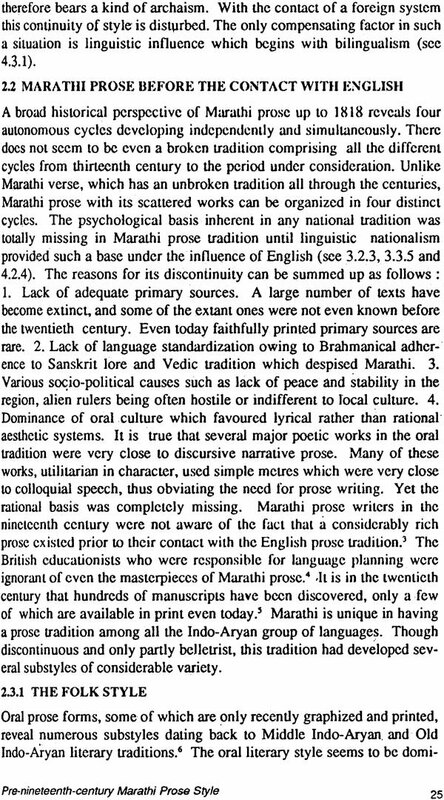 The contact of the English language with Marathi had preceded the political contact when the Missionaries started their proselytizauon activities at the beginning of the nineteenth century." The contact had been a durable and prolonged type, giving rise to several socio-linguistic phenomena peculiar to Indian situation (see Chapter 4). The role of the English language in the cultural renaissance in India during the nineteenth century has been unanimously accepted by social scientists, linguists and critics." 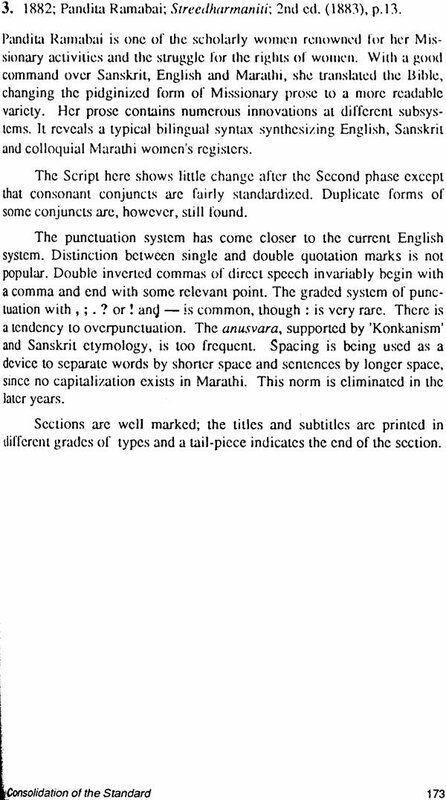 The most popular description of this contact in Marathi is "English incarnation of Marathi prose"." Several contemporary British educationists and officials compared the role of English in India to that of Greek and Latin in Europe during ¥e late Middle Ages." The impact of Western thought through the English language was all-pervasive. It gradually encroached upon the oral culture and encouraged written culture as the sole literary style of expression in all walks of life. 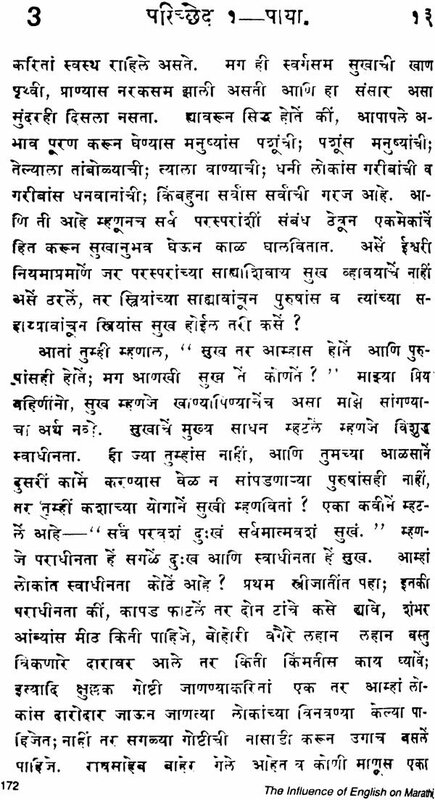 Even a slight shade of the English language in the writing increased the acceptability and prestige of an argument in Marathi. 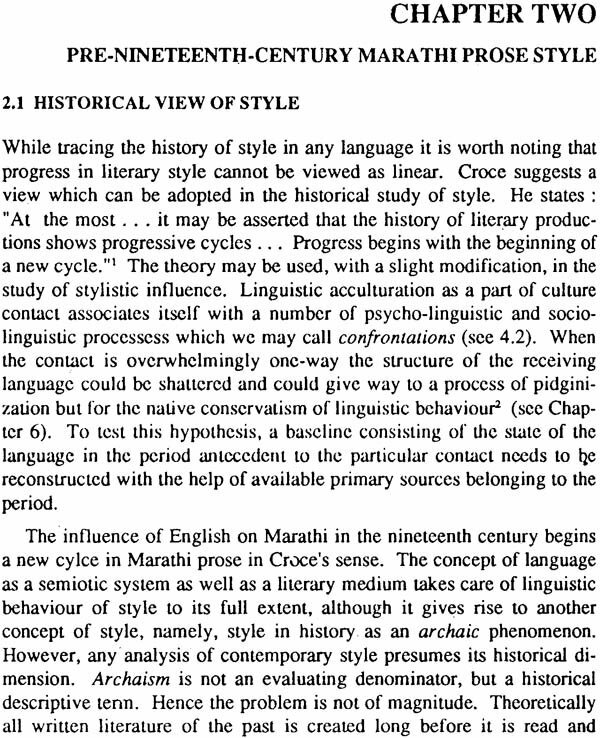 As the total cultural contact ushered in a new age in Maharashtra and India, the need for a new mode of communication, namely prose, was felt as essential towards new uses of the language (sec 1.1.4). The direct or indirect effects of colonization on the linguistic situation in India arc of far greater significance than the meagre studies of these problems done so far would reflect. 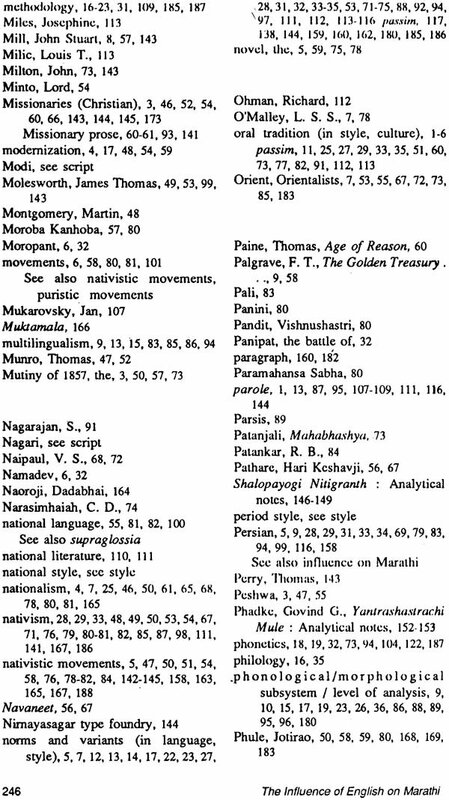 Learning, throughout the nineteenth century, became synonymous with the ability to read and write the English language, a social substitute for the ancient system of learning the Sanskrit language (see 3.3 and 4.2.5). English education was institutionalized and this involved learning the English language together with English literature. There was little freedom to choose the aspects of learning other than those institutionalized and this perpetuated definite linguistic influences. All educational institutions were started with a view to transforming the Hindu view of life, dominated by the karma theory, to the modem European outlook of science and rationalism. 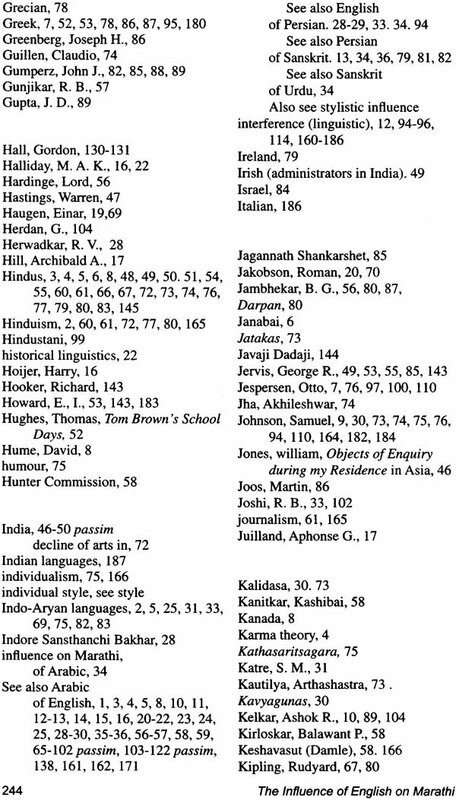 Since learning in the nineetenth century was monopolized by the upper caste Brahmans, both modernization and revivalism bore the stamp of Brahmanization (see 3.2.3, 3.4 and 3.5). 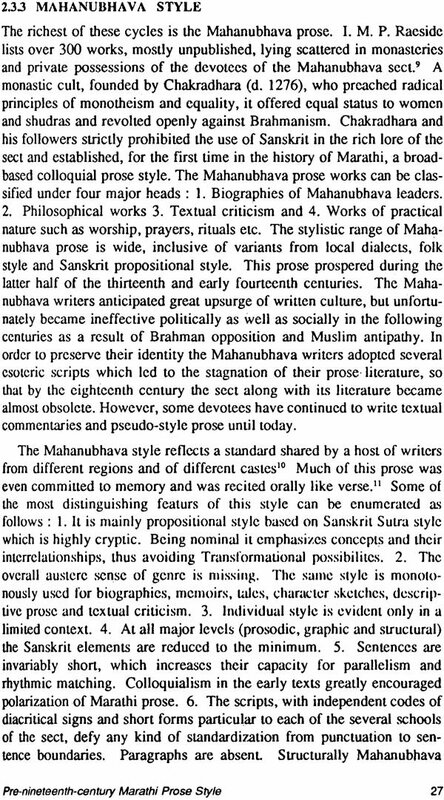 The socio-linguistic implication of Brahmanization was that it helped speedy standardization of Marathi prose, because the written standards, formulated mainly by Brahman writers, were imitated wholly by other writers and there was least interference from other sociolects (see 4.4). 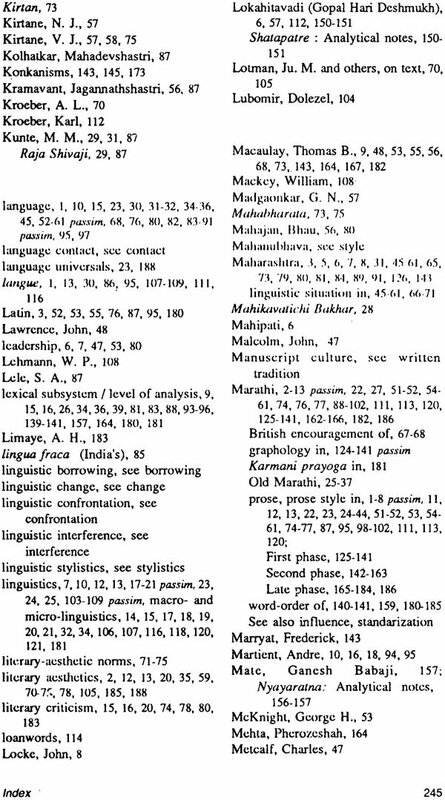 The influence of English on Marathi prose can be divided broadly into three phases, 1 : IHIH to IH47, 2: 1847 to 1874, and 3 : 1874 to about 1890. By the last decade of the nineteenth century a standard prose style was clearly evolved, as it is evident in the works of English educated prose writers such as Vishnushastri Chiplunkar, Gopal Ganesh Agarkar, Bal Gangadhar Tilak and Hari Narayan Apte. - This division into phases is intended more to mark the different stages of the influence of English than for suggesting that any startling change was to be expected merely because one phase ended in 1847 and another began in the same year. Although these stages of influence are by no means clearcut, each of them can be correlated with the. 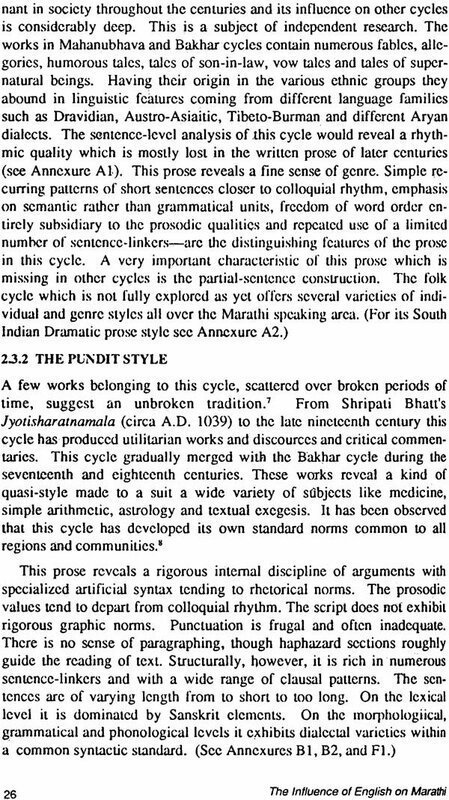 prose works written during the successive phases of increasing bilingualism. Of the many indices of the influence the most important has been the steady growth of English education, and consequently, of borrowing from the English language. At the deeper level, a new view of life and change in the sensibility of society was steadily taking pi ace, replacing the old traditions which had been well-suited only for the needs of the medieval society. By the end of the century, the old tradition of oral literature was almost forgotten by the intelligentsia and it had to be revived by nativistic movement as part of the revival of pride in Indian culture (see 3.2.3 and 4.2.4). As the language was being increasingly anglicized, isolated cries for purity were voiced regularly though these were not backed up by tangible cultural or social behaviour. However, even the extremist type of nationalism did not totally denounce the continuous role of English as a civilizing force, and puristic movements did not succeed beyond substituting translation loans for the earlier direct loans from English. English influence had, by that time, already become firmly established in several subsystems of language structure. As the influence matured by 1885 several substyles of literary genres (also borrowed from English) and of individual works and author became specialized under the influence of English. The process of standardization began earlier than that of stylistic norm formation, as language standardization is the prerequisite of the formation of stylistic norms. The influence of English was thus absolute and all-round and penetrated deeply into the structure of the language, giving little scope to revival of old forms of expression in the oral tradition of Marathi. Various literary forms of the oral tradition still continued to be active in the illiterate rural masses, while the new English forms like the novel, tragedy, comedy and essay were being established along with the new prose style. At the end of the century, there was a clear division between two types of language use: the elitist and the proletarian, the distinguishing factor being bilingualism (see 4,3,2,). The transition from the oral to the written and from manuscript to print culture was the first requisite of the new prose style, which was laboriously accomplished by the first generation of the prose writers in the First phase (1818-1857). 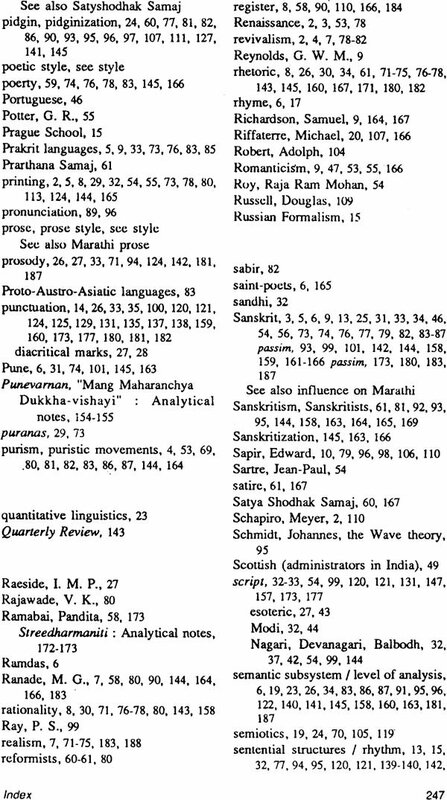 Specialization of the features of the written language took place along with the emergence of a new standard in the Second phase (1847-1874), and as the standard was consolidated in the Third phase (1874-1890), the transition from Sanskrit bilingualism to English bilingualism of Marathi writers was complete.